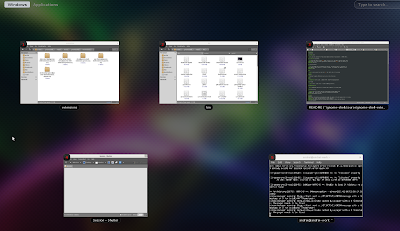 Are you missing a task switcher in GNOME Shell? Want the power-off button back? Well, you'll be glad to know that GNOME Shell supports extensions and a pack has already been released, covering these as well as some other features that you may want in GNOME Shell. 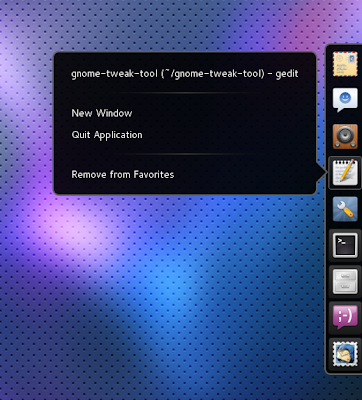 GNOME Shell Extensions is a collections of extensions providing additional functionality for GNOME Shell. The first public release was made two days ago but the extensions didn't really work because of a bug in GNOME Shell - which was fixed today. Alternative Status Menu: adds a "Power off" menu item visible at all time (and not just when pressing the ALT key) in the status menu. Dock: shows a dock-style task switcher to the right side of the screen and is visible all the time (unlike the Dash "dock" displayed on the left that's only displayed in the "Activities" view). Right now, the dock looks almost the same as the Dash dock except it's smaller. Auto Move Windows: you can assign a specific workspace to each application. Gajim: Integration with Gajim, a Jabber/XMPP instant messaging client. User Theme: Loads a shell theme from ~/.themes/THEME_NAME/gnome-shell. Xrandr Indicator: Replace the GTK+ based indicator from gnome-settings-daemon with a native one. Lets the user rotate the laptop monitor and open display preferences quickly. Apologies for the video quality (I had to stop sometimes so GNOME Shell doesn't crash because of a memory leak when recording; also the font is broken in the video for some reason - unfortunately I don't know how to fix that).